Polymer Clay (SCULPEY BRAND) can be used to cover a variety of items: wood, glass, metal, pens and more. 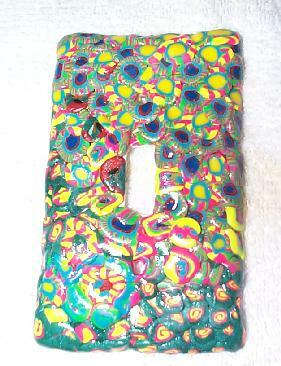 See my Clay page For general lessons and ideas for using Polymer Clay. 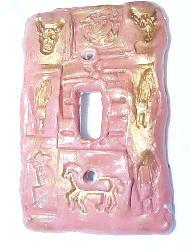 Clay Light Switch Cover With Cane Slices. This project uses only cane slices placed directly on the switch cover. I used similiar colored canes slices to give the blended look. 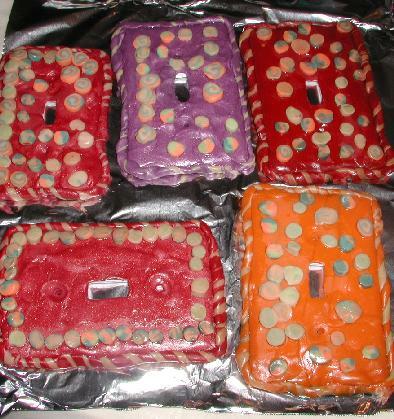 Polymer clay can be put onto the Switch Plate directly and baked as directed in a regular polymer clay project. In this case I was teaching a class of 3 and 4 year olds, so I kept the designs simple. Older children can cover the whole thing with fancy clay slices. White Sculpey (sold in 2 pound boxes) is cheaper than Sculpey 3. It is also softer to use. We also used the new Glow in the Dark Sculpey for the decorations. Children love the idea of Glow in the Dark anything! 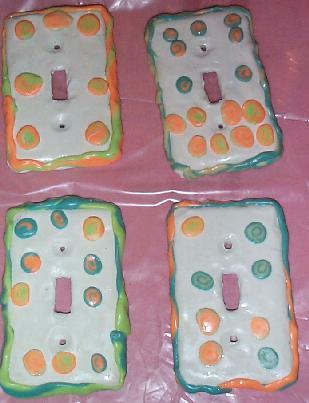 The light switch's decorations and border will all glow in the dark to help the children find the light in the dark! When clay is soften, roll through a pasta machine on the #1 setting or roll flat sheets about 1/4 inch thick. Trim the extra clay after covering the top and the sides. Make sure to remove the clay from the switch hole and the screw holes. I suggest you also use your finger to indent around the screw holes other wise a longer screw would be needed than the one given to you at the store. Or use snakes to write their name. In the picture on this page, we used jelly roll canes and twisted snakes. Jelly rolls were just rolling the clay in flat sheets. Laying two or three different color sheets on top of each other. Trim to a even shape. Roll them up like a jelly roll. Since these were little children, I cut them and helped them decide which colors and slices to put on. Here is a great way to use up those cane slices that are left over and possible squished! Micah age 9 took all of my left over and damaged canes. He pressed them directly onto a triple switch cover. Blending them to look like a giant marble. Finished off with Sulpey Gloss for a real great look. 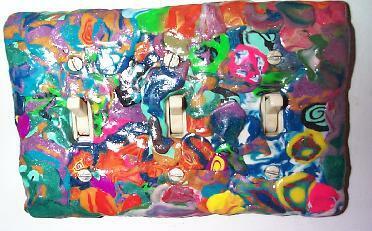 Rubber Stamping is a great way for the youngest child to a Senior Citizen to make an interesting light switch. With a little imagination and almost no talent the project can come out great! Clay can be all one color or marbelized. See my Rubber Stamp Projects on Clay For more directions how to make rubber stamps on clay. Clay is rubber stamped with Native American designs. The rubber stamps were available through a catalog. I think S & S but it was a long time ago. My son made this a few years ago. Forgot to put the picture on line! Clay is rolled out to about 1/2 thick laid onto the light switch. Mark name on back of Switch Cover with permanet marker. Trim clay to fit the cover, cutting the switch openning and the screw holes. The rubber stamps are stamped all over the clay. The clay is baked per instructions. After it is cooled, either dust the gold powder on or add to gloss and paint.